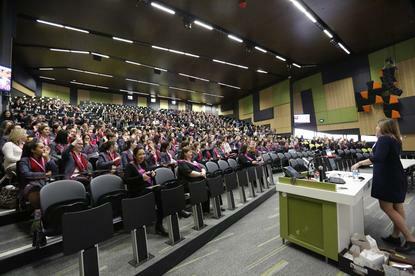 Blachford delivered the main keynote address to more than 1,600 teenage girls, age 13-17, and 136 teachers from 61 schools, who attended the recent Go Girl, Go For IT conference at Melbourne's Deakin University. There were 125 speakers and 88 sessions running throughout the day. The event was aimed at inspiring and encouraging girls to pursue a career in science and technology and spearheaded by Vic ICT for Women (a volunteer group of ICT female professionals that work to recruit and retain and promote women in IT). In an effort to inspire and encourage, Blachford detailed her unplanned journey into IT, and told attendees how a career in ICT is no longer out of reach and will offer endless opportunities across any industry. She said she is a case in point. Blachford, who worked for Facebook for 6 years in the UK, Melbourne and Sydney, said her career path after attending Melbourne University was completely unplanned. She fell into a career in IT after completing an arts degree and ironically, ended up doing very few arts subjects and instead majored in psychology and economics. “I don’t know how to code. I am not an engineer. I am not really techie. I can build a powerpoint presentation, but that’s about it," she told attendees. Looking back over her time in the ICT industry, Blachford said she has learned to move fast, break boundaries and take risks. “I have learned and I developed a lot over my time. I started with three years in London, working with some amazing brands and businesses over there. When the chance to move home to Melbourne came up in 2012, I jumped at it to help set up the Facebook office that existed here in the CBD,” she said. Her time at Instagram, meanwhile, has also taught her to take risks, innovate and be agile - key lessons she urged attendees to take to heart. But there’s work to be done in getting the message out about the importance of girls and women gravitating towards a career in ICT. Having positive role models like Blachford tell their story to girls is the first step, said Fi Slaven, director of Go Girl, Go For IT. Slaven said the Go Girl Go program, which hosts a special themed conference every two years, is so important because it aims to “break down barriers and educate girls” on the countless opportunities that ICT represents for them today and in the future. Deakin University vice-chancellor, Professor Jane den Hollander, echoed the sentiment, urging girls to focus on coding and to consider the importance and implications of data in everyday life. “The jobs of the future need talented women with skills in technology. By 2025, it is estimated that two-thirds of all jobs will require post Year 12 skills that require the application of those skills in the workplace,” she said. Professor den Hollander, who runs a $1.2 billion university, and has had many experiences around the globe thanks to her biochemistry degree and subsequent PHD, said it is critical for girls to consider a career in science.